A final against Tipperary or Limerick on 27 July now beckons. WATERFORD HURLING RECEIVED a timely boost after last Sunday’s Munster senior final hammering as they unleashed a powerful display to blow away Clare in tonight’s Bord Gáis Energy Munster U21 hurling semi-final at Walsh Park. The home side ran out convincing winners as they overcame a two-point deficit at the break to completely dominate the second half action. Stephen Bennett hit the net twice while Colm Roche raised a third flag and Patrick Curran finished with 0-10 as Waterford took over. A final place on 27 July now beckons for Waterford as a reward for tonight’s success. Tomorrow night they will discover the identity of their opponents in the decider as Tipperary take on Limerick in Semple Stadium. It was a remarkable outcome to a game that had seen Clare get the best start with an Oisin Donnellan goal in the 8th minute, after Colin Crehan’s initial shot was blocked. That was the launchpad for Banner dominance as Kevin Hehir, David Conoy and Ben O’Gorman hit a brace of points apiece to demonstrate their accurate scoretaking from distance. A Conroy point in the 24th minute left Clare in front 1-9 to 0-6 but they only managed to score 0-2 for the remainder of the game. That was down to the difficulty they faced hurling against the wind in the second-half but also the improvement in Waterford’s play as they exhibited the class that exists in this team. Crucially Waterford hit 0-4 without reply before the interval courtesy of Austin Gleeson, Curran (2) and Mark O’Brien to only trail 1-9 to 0-10 at the midway mark. And then they wiped out Clare’s advantage within 13 seconds of the resumption as Mikey Kearney created the chance for Stephen Bennett finish clinically to the net. Waterford built on that goal to hit five points in a row before Bennett’s second goal arrived in the 37th minute when he pounced on a mistake by Clare defender David Fitzgerald. They were 2-15 to 1-9 in front at that stage and it shooting practice thereafter for Waterford in front of a crowd of 4,126 fans. Colm Roche struck home the third goal for Waterford in the 44th minute with a splendid finish after surging into space. Clare kept fighting yet their efforts to grab goals late on were halted by Waterford netminder Jordan Henley who produced a string of fine saves to deny Bobby Duggan twice and Pauric O’Loughlin. Scorers for Waterford: Patrick Curran 0-9 (0-7f, 0-1 ’65), Stephen Bennett 2-3, Colm Roche 1-0, Shane Bennett, Mikey Kearney, Mark O’Brien, Austin Gleeson (0-1 sideline) 0-2 each, Tom Devine, Peter Hogan 0-1 each. Scorers for Clare: Oisin Donnellan 1-0, David Conroy 0-3, Kevin Hehir, Ben O’Gorman 0-2 each, Ryan Taylor, Aron Shanagher, Bobby Duggan (0-1f), Shane Gleeson 0-1 each. Email “Boost for Waterford hurling as U21 side storm into Munster final with 18-point win over Clare”. 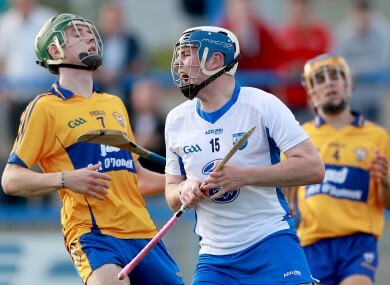 Feedback on “Boost for Waterford hurling as U21 side storm into Munster final with 18-point win over Clare”.